In a small bowl whisk all of you marinade ingredients together. Slice your chicken 3/4 the way through about 3/4-1" apart. Place chicken breasts in a gallon sized ziploc back and pour marinade over chicken and toss to coat. Meanwhile while chicken is marinating slice all your peppers into thin strips. Remove chicken from refrigerator and stuff each slit with one red, green and orange pepper. Place chicken on baking sheet and bake for 25-30 minutes until internal temperature reaches 160-165. 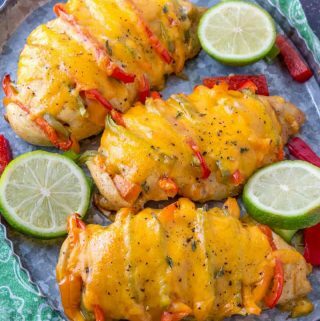 Sprinkle cheese on top of each breast and bake for about 5 minutes longer until melted. Remove from oven and sprinkle with some fresh ground pepper and drizzle with some lime juice if desired.